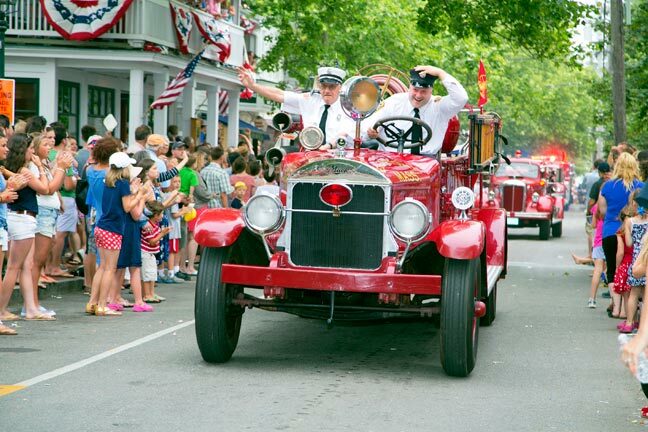 The clock struck 5 pm, and a line of festive parade floats took off Thursday from the Edgartown School to start the annual Fourth of July parade, with horns honkin’ and flags wavin’. 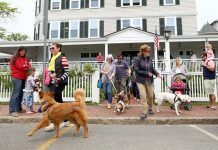 Approximately a dozen people represented the Animal Shelter of Martha’s Vineyard. They walked the parade route with several dogs and received “aww’s” from the crowd. 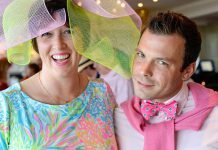 From the classic bagpipes, fifes, and drums to Camp Jabberwocky’s colorful Vegas themed float, everybody had a favorite. For nine-year-old Victoria Almeida it wasn’t a tough decision. She said the best part of the parade are the emergency service vehicles that honk horns and blare sirens through the streets of Edgartown. The Almeidas recently moved to Vineyard Haven from Worcester. The family made a day out of the Fourth of July with plans to fish and return to Edgartown in time for the fireworks. Victoria wore a headband with bobbly red and blue stars, and waved a small red, white, and blue pom-pom as the floats paraded through. She didn’t fail to point out one of her other favorite parts of the parade. As the floats paraded through the streets of Edgartown, friendly waves were often rewarded with fistfuls of candy. “It’s important to share though,” Victoria said with a smile.